I haven’t posted any photos lately, so here is one that I quite like. 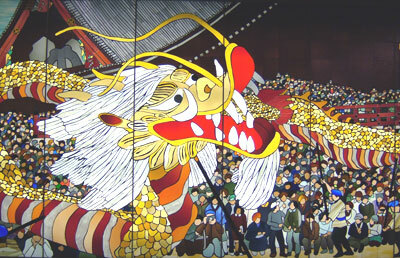 It is of a mural that I recently noticed at Asakusa Station (on the Tsukuba Express line). This entry was posted in Photography on March 4, 2008 by Shaney. Two of my colleagues are from Nepal, so I am learning a lot about their country these days. One of my colleagues introduced me to a Nepali blogger named Rajesh KC, who also happens to be a famous Nepali cartoonist. In his latest blog post, Rajesh captured views of Kathmandu over a rare one-week period of clear skies. For a week Nepal had cloudless blue skies starting from November 15 (2007). Kathmandu illuminated under the mountain range from Dhaulagiri to Gaurishanker. Mets said the clear skies in Nepal are due to a cyclone in the Bay of Bengal. When the skies are clear in the Valley, 80% of the Himalayan range can be seen from Lalitpur area. >>See Rajesh’s stunning photos of Kathmandu. And if you like those photos, you also might like the ones he took of Manang, an area of Nepal that is rich with Tibetan influences. This entry was posted in Photography on November 27, 2007 by Shaney. I feel like I owe it to my readers to post something beautiful after forcing you to look at such an ugly site. 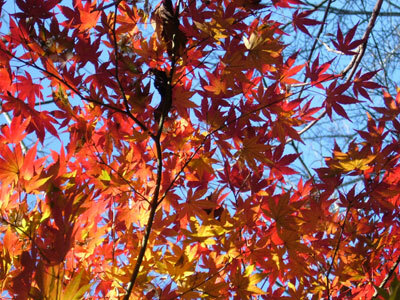 Here is a nice autumn scene to help you erase that abomination from your visual cortex. This entry was posted in Photography on November 26, 2007 by Shaney.